Families'll find big savings at Belmont Park, Birch Aquarium, and beyond. Families'll find big savings at Belmont Park, Birch Aquarium, and beyond. 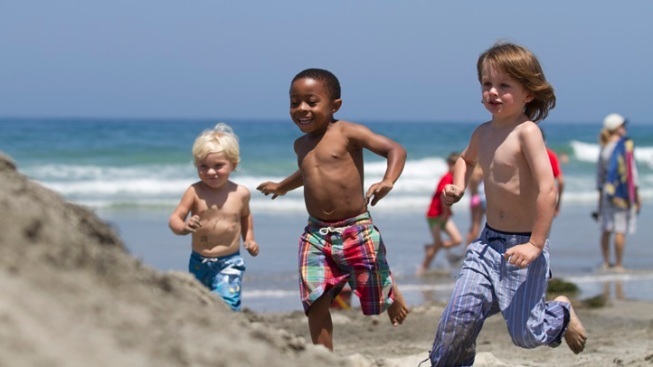 It's the annual "Kids Free" deal for the whole month of October throughout greater San Diego. WHILE FALLING LEAVES... and crisp breezes and apple cider and pumpkin treats are the typical hallmarks that spring to mind when the notion of "October," and all that it stands for, pops up, many a SoCaler might land upon some different imagery. Sandy soft beaches, for one, and anemone-filled tide pools, and harbor seals, and model railroads, and vintage airplanes, and oil paintings, and surfboards, and the list is as lengthy as a gorgeous stretch of sand on Coronado Island. October, 'round about San Diego and its many vibrant communities, isn't so much about pumpkin treats and cider -- though those absolutely exist, of course -- but rather about the really free deals for kids at over a hundred places around the region. It's tradition, during the entire tenth month of the year, so waive entrance fees or discount admission prices for children at a host of hotels and attractions and museums and parks. The name? You probably know it by now, if you have tots and you've done LEGOland or Children's Pool at La Jolla or the San Diego Zoo: It's Kids Free San Diego, an all-October-long save-cash-tacular that covers so many places that not even those people intent on covering them all could cover them all. THAT'S SUPER BIG, as we said, but once you get a look at the participant roster you'll be on-board the big train: The California Surf Museum in Oceanside is waiving the admission for a kid 12-and-under if their accompanying grown-up pays for an adult ticket of their own. Same deal, almost, at the San Diego Air & Space Museum in downtown San Diego. Same deal at the Japanese Friendship Garden, which is also in San Diego. "Same deal" are words you're apt to say a few times here, and while there's some fine print -- like how many kids getting in for free can join that paid adult -- the discount-amazingness cannot be denied. These are real money-savers for a traveling crew, should that crew want to visit some of the city's famous attractions and destinations during October. Will you be down in San Diego anyway, visiting friends or family, during the month? You gotta do at least one of these places. Have you not yet planned your vacation but now feel suddenly inspired by all of the kids-get-in-free-ness? Start here, money-pocketing fun planners.